Western blot analysis of extracts from mouse, rat, and fetal rat brain using Synapsin-1 (D13C1) Rabbit mAb. 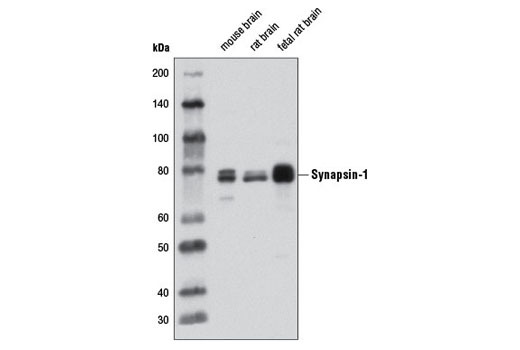 Synapsin-1 (D13C1) Rabbit mAb detects endogenous levels of total synapsin-1 protein. The antigen is 100% conserved between human synapsin-1a and synapsin-1b. Monoclonal antibody is produced by immunizing animals with a synthetic peptide corresponding to residues surrounding Pro575 of human synapsin-1 protein.